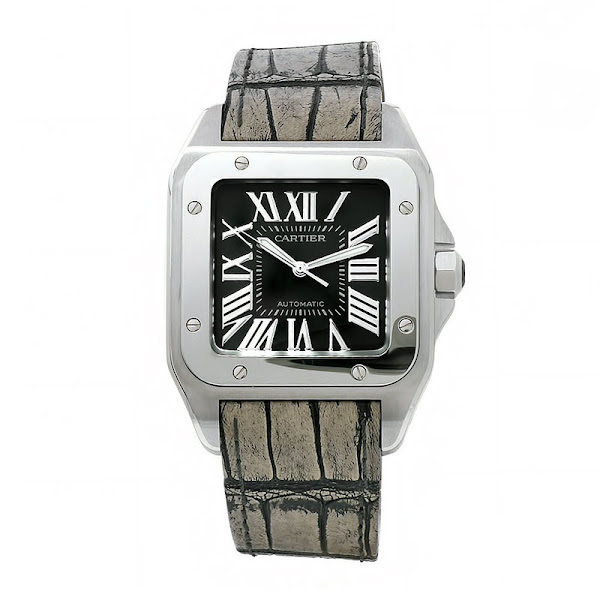 The W20134X8 is Cartier's Santos series model with a thrilling combination of a silvertone steel-two-tone, titanium-two-tone and alligator leather. Its band combines alligator leather with stainless steel and titanium accents to add an athletic edge to your fashionable looks. This Cartier watch features a scratch resistant sapphire crystal ensure lasting quality for this bold beauty and a stud-accented bezel to complement its chic look. This watch also comes with a grey alligator-style leather straps this watch to the wrist, while a leather-deployment-buckle-with-safety clasp ensures its secure placement. This adorable timepiece begins with a rounded square 38 mm silvertone steel case. Besides, this timepiece has a dashing grey dial and a Roman numeral hour markers. Powered by Swiss-automatic (self-winding) movement. Finally, this watch boasts water resistance up to 330 feet. This Cartier Santos's original price is $6,000. You can find an original Cartier W20134X8 Watch at the site(s) listed above. However, we don’t guarantee its availability as being listed here simply means that those site(s) has the item in question by the time we wrote the review. The review in this page is written by garnish at Tuesday, September 27, 2011. The post is tagged as analog, cartier, men, watch, women.